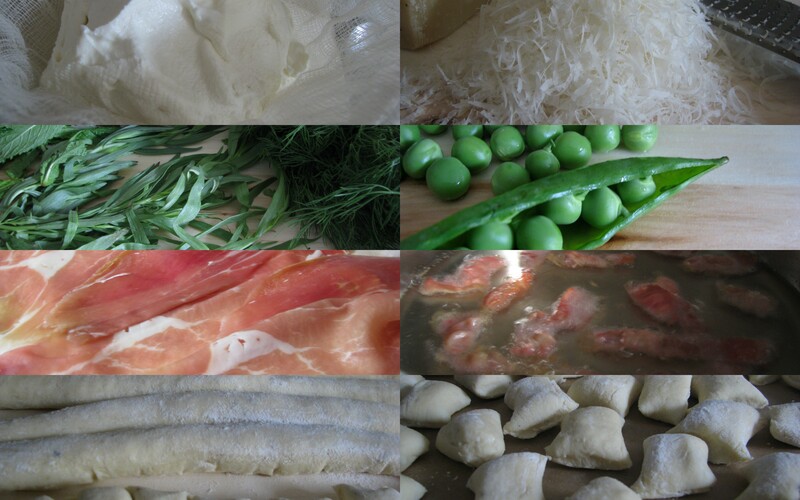 I’d been waiting for spring to try these ricotta gnocchis with pea puree and jamón serrano. The ñoquis del 29 are meant to attract prosperity, so a little extra green can’t hurt. Adapted from Michelle Bernstein’s Cuisine à Latina. Combine the stock, cream, and cayenne in a large heavy pot and bring to a boil. Remove from the heat and set aside to cool to room temperature. Bring a small pot of salted water to a boil. Fill a medium bowl halfway with ice water. Add the peas to the boiling water and cook just until tender, about 2 minutes if fresh, 30 seconds if frozen. Use a slotted spoon or strainer to transfer the peas to the ice water to stop the cooking and set the color, then drain and set aside (see note). Refill the bowl. Add the mint, parsley, tarragon and dill to the boiling water and blanch for 10 to 15 seconds. Drain and transfer the herbs to the ice water to stop the cooking. Drain the herbs, gather them in to a tight ball, wrap in a clean kitchen towel, and squeeze to remove as much water as possible. Unwrap the herbs and set aside in a bowl (see note). Put the cream mixture, peas and herbs into a blender or food processor and puree until completely smooth. Strain the mixture through a fine-mesh strainer into a bowl. Season to taste with salt, pepper and sugar (if using frozen peas) and set aside. Bring a large pot of salted water to a boil. Add the gnocchi and cook until they float to the surface, 1 to 2 minutes. Meanwhile, melt the butter in a wide heavy skillet over medium heat. Add the strips of ham and cook until just crisp, about 1-2 minutes. Add the gnocchi and toss until just heated through. Remove from heat and adjust seasonings to taste. 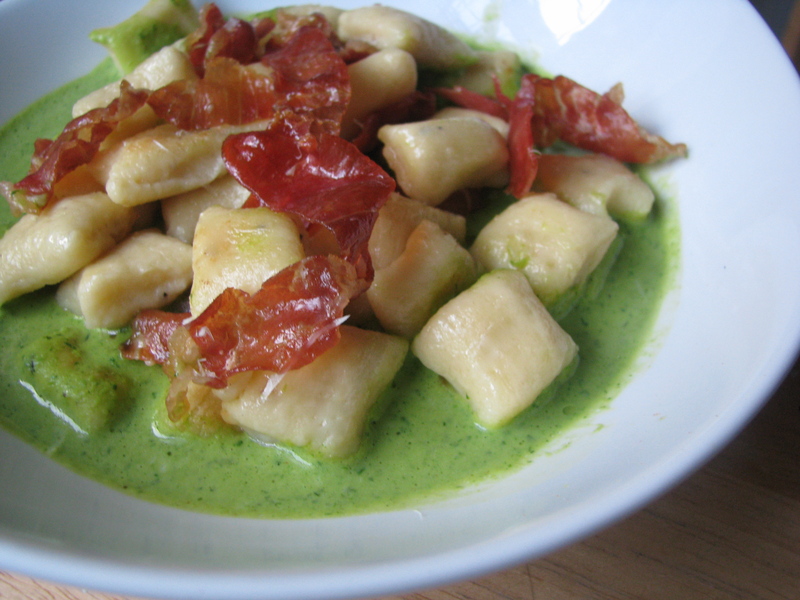 Divide the pea puree among the plates and spoon the hot gnocchi over the puree. Sprinkle with grated Parmesan and serve immediately. Notes: I lowered the peas and herbs in the boiling water using a fine mesh strainer so it could be pulled and plunged in the ice bath quickly. Put the ricotta in the center of a double layer of cheesecloth or a clean kitchen towel and wrap the cheese well. Working over a bowl or sink, turn the ends of the cloth as though wringing a towel to extract as much liquid as possible. In a large clean bowl, mix the drained ricotta, egg yolks, Parmesan, salt, and pepper with a wooden spoon. Add the flour 1/2 cup at a time, stirring gently, until a firm but soft dough forms (a small piece should hold its shape). Divide dough into 6-8 portions. Form 1 piece of dough into a 1/2-inch-thick rope on a lightly floured surface. Cut rope into 1/2-inch pieces. Repeat with remaining dough. Bring a large pot of salted water to a boil. Add the gnocchi and boil until they rise to the surface, 1 to 2 minutes. Use a slotted spoon to transfer them to a bowl. mmmmmm…. this looks so good. Gnocci is my favorite. What to cook with boiling water and how to boil water in the mountains?